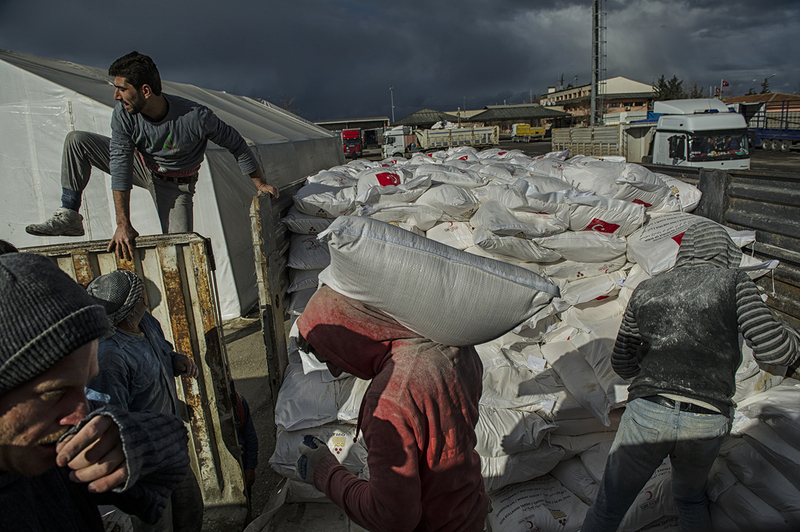 Turkish workers load bags of flour provided by the Turkish Red Crescent onto a truck bound for Syria, at the Turkish Syrian border, in Kilis, Turkey, February 11, 2013. Roughly 800,000 Syrians have been displaced to neighboring countries by the fighting across Syria, and the aid to refugees has been marred by politics. The United States claims it has donated millions of dollars to Syria in aid, though there has been little visible sign of it across northern Aleppo Province. Two years into the country's uprising and civil war, there is a massive need for humanitarian aid--both food and non-food items--across Syria.